Big Update: Chiefs, Panthers, Jets, & Titans get on the board, 49ers rise to 2nd place. The Fantasy Crime League has gotten 6 arrests since the last update. Pre-season football is underway and we are weeks away from the beginning of the regular season. Mr. Hunter turned himself in to authorities on Monday July 20, for his alleged involvement at a July 3rd incident in Virginia Beach where a large fight occurred and a victim was taken to the hospital. The VA Beach Inmate Database has a man with the DOB as Mr. Hunter was charged with “malicious intent, stabbing, cutting, wounding” although later reports do not mention that the victim had any stab wounds, only a broken jaw and chipped tooth.. Hunter was released on 25 K bond the next day and is expected to be at Titans training camp which begins July 31st. The felony assault is 4 points, with a bonus point which is 5 points total for the Tennessee Titans. Mr. Cox was arrested on July 20 for aggravated domestic violence, trespassing, and burglary of a residence after a call was placed to authorities regarding an alleged incident at Aspen Heights Apartment complex. This is Mr. Cox’s 2nd domestic violence charge in less than a year, as he was charged in Nov. 2014 when he was with the Mississippi State University Bulldogs. He signed with Chiefs as a undrafted free agent in May 2015. He was released on July 21. Felony domestic violence is 4 points, 4 points for the felony burglary charge, 2 points for the misdemeanor trespassing charge (in connection with burglary- its a crime against property), and 1 bonus point for another domestic violence incident. 11 points for the Kansas City Chiefs. Mr. Hill was cited on July 28th for possession of drug paraphernalia after he was pulled over after a police officer noticed him without a seat belt (some news outlets are reporting it as a misdemeanor- it is not, only an ). The officer found him in possession of 2 grinders with marijuana residue. Mr. Hill tore his ACL on August 2 and was cut from the team. Drugs are bad, mmmkay. 3 points total for the Carolina Panthers. Mr. Richardson was suspended by the league for 4 games for violating the substance abuse policy. Only an hour after Mr. Richardson said, “I apologized to my teammates and this organization, and I told them they don’t have to worry about my name being in the news again.” a report came out that Mr. Richardson’s name indeed was in the news again for an arrest on July 14 in Missouri. He was arrested in connection with a road race, (clocked at 143 mph in his Bentley ) and evading police. He parked in a residential neighborhood, but the cops saw his brake light. Andrew Quarless laughed at his horrible GTA-esque attempt to hide. Richardson was with 2 male adult passengers as well as a 12 year old boy. The authorities smelled marijuana in the car, but found none. They also found a loaded handgun. No charges for drugs, the gun was properly registered, and there was not enough definitive proof to charge for child endangerment. 2 for street racing, 2 for resisting arrest and a bonus point for that hilarious news conference (did he actually think the story wouldn’t come out haha) . 5 points total for the New York Jets. Breaking: Geno Smith’s jaw requires surgery and he is out 6-10 weeks after being punched by a now former teammate in the locker room. Smith has the right to press charges, but I bet he’s not talking about it at this time. I heard he wasn’t wearing the red jersey at the time, so he should have known it’s full go in the locker room. Should Mr. Enemkpali be charged, the points will go to the Buffalo Bills. On July 7th, Mr. Galette was cited for 3 traffic violations, and his arraignment was on August 10th. Mr. Galette was arrested earlier this year for domestic violence, but the charges were dropped, he does face a civil suit from that incident though. In addition, the Saints and the NFL were made aware of a 2013 video that surfaced in July that allegedly shows Galette striking a woman with a belt during a group scuffle on a beach that was recorded by an onlooker.As a result of these transgressions,formerly the New Orleans defensive captain, Mr. Galette was released by the Saints on July 24. I looked at the Louisiana statues, found nothing for brake tag being a misdemeanor- only fines, unless it was a fraudulent use of them. I’m giving 2 points for the expired plate and suspended license. 2 points total for the New Orleans Saints. The explosive pass rusher Aldon Smith, who is a Fantasy Crime League All-Star (4 seasons with 49ers with 5 separate incidents, including 3 DUIs, guns/drug charges, and a bomb incident at LAX) was arrested on Friday August 7th for DUI, Hit and Run, and Vandalism by Santa Clara Police. According to TMZ, Smith’s ex-girlfriend is now with Kaepernick and they got into a training camp scuffle. Smith is all-done with the 49ers as he was released August 8th. Smith maintains that he was not under the influence and that the truth will come out. 3 points for DUI, 2 points for hit and run, 2 points for vandalism, and a bonus point for probably the worst off-season ever. Somewhere in Ann Arbor, Jim Harbaugh is laughing, presumably hard. 8 points total for the Santa Clara 49ers. Housekeeping: Bills OL Coach Kromer got the battery charge dropped- so that was the only charge and that remains a 4 pointer. The points have been accurately adjusted. A Cardinals player was arrested the night before the super bowl- so it does not count within the Fantasy Crime League. Well for the latest standings: The Green Bay Packers still lead with 14 points. The San Francisco 49ers jump to 2nd place. The Detroit Lions and Kansas City Chiefs are tied for 4th place. The Houston Texans are in 5th place holding the tiebreaker over the Baltimore Ravens in 6th place. The Chicago Bears are in 7th place, Indianapolis Colts are in 8th place, while the New York Jets, Atlanta Falcons, and Tennessee Titans are tied for 11th place. The Buffalo Bills hold on to the 12th spot, while the New Orleans Saints are in 13th place. The Arizona Cardinals, Dallas Cowboys, and Carolina Panthers are tied for 16th place with the Pittsburgh Steelers are on the board, rounding out 17th place. Well looks like more than half of the 32 teams have an arrest and all divisions have an arrest. 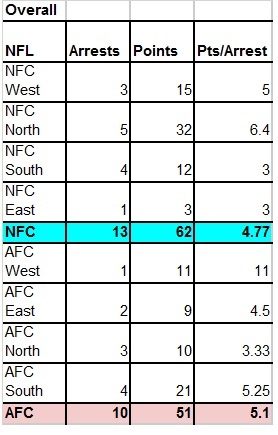 The NFC North still leads all divisions by far with 32 points on 5 arrests, the next highest is the AFC South with 21 points on 4 arrests. The NFL regular season is so close we can feel it and that means that the fantasy crime league is winding down. So be sure to get all your FCL news here! Take care everyone.